Accurately record evidence of attendance, GPS, photographic data, time-sheets and much more! Many large organisations and government agencies request that their service providers and contractors meet stringent service level agreements and adhere to strict requirements involving pre-qualification risk assessments, insurance and induction standards. Contracts often demand evidence of attendance, GPS, photographic and timesheet data as well as automated financial reconciliation capabilities. The Loc8 platform allows users to accurately record all of these requirements as well as the demand for the collection of asset risk, condition and status or lifecycle management data. 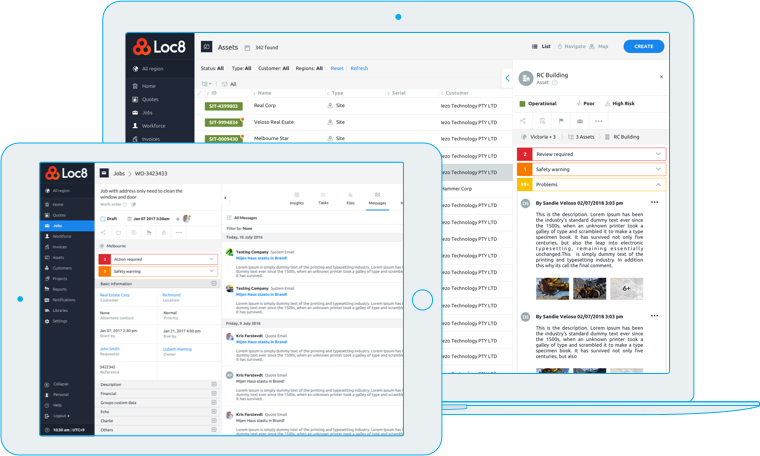 Loc8 takes these requirements and features one step further and offers a unique collaboration platform that automates communication, shares data and provides transparency between large and small organisations, contractors and asset owners. Contractors receiving jobs through the mechanism must complete insurance and safety requirements specified by their customers, follow specific processes and allow data like GPS location, photos, timesheets, asset and task data results to pass in real-time from their system through to their customers’ or the originating job system. The increased transparency dramatically reduces the human touch required to dispatch, monitor, complete and invoice jobs and maintenance activities in both customer and contractor businesses.